Tooting is a busy London suburb stretching between and beyond two tube stations (Tooting Bec and Broadway) and along the A24, originally a Roman road and now a major arterial road carrying 10 million cars a year and numerous bus routes. One of our earliest TTT blog posts shows a map and satellite image of the area. As this shows, Tooting has its fair share of green space, but little centrally that is publicly accessible, very few allotments and many homes with little or no outside space. 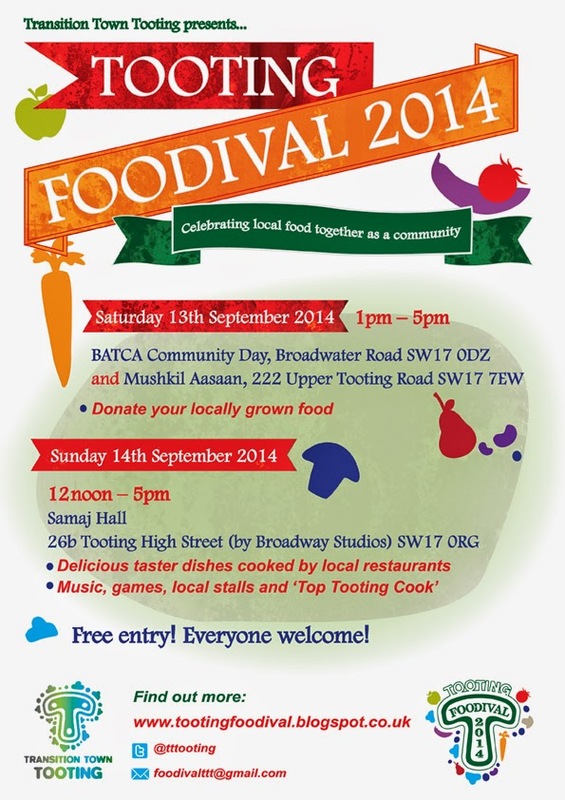 Despite this, one of the first and most enduring of Transition Tooting’s activities is our annual Foodival, which celebrates food that is locally grown, cooked and eaten. From the very first event in event October 2008 (pics here) the event has sought to explore and celebrate the range of food that can be grown in the city and the diverse cultures found in Tooting, giving local people a chance to meet, learn from each other and have some fun. Perhaps it is true what they say about the way to one’s heart being through your stomach, the event certainly inspired people to get growing and food shared at Foodivals has comes from window boxes, back yard and high-rise balconies (as the map here – and this lovely montage attests!). 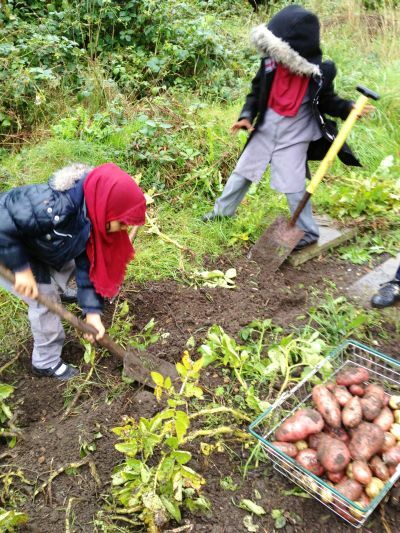 Despite this it was two and a half years before Transition Tooting got its first chance to really get its hands in the soil when our fantastic supporter, Naseem Aboobaker, offered us the chance to turn some unused land into a temporary community garden. The soil was first broken at our Big Dig event in June 2011. In the three years since, the Garden has attracted many volunteers who come for many reasons – to do something local, practical and different, alone or with family and friends; to meet new people; to enjoy time outdoors and get some exercise; and of course to learn about and grow healthy food. We grow lots of things, and some are timed to be ready for the Foodival each September: this year there are three kinds of potatoes, sunflowers and garlic. When they are lifted we can get on with autumn sowings of broad beans, wheat and more garlic. Growing vegetables and flowers immediately puts us in touch with the cycles of the whole year’s seasons and even unconsciously we connect with wet and dry weather; day length; what’s flourishing or not doing so well; what we should do now or plan to do in response or in anticipation. We hold regular sessions for children from a local Primary School (Gatton School) who planted potatoes in March and April, and, when the autumn term starts, will dig them up (see right). One ten-year old said: “For some of us, who have only seen vegetables in the supermarket, we were amazed to find out that potatoes grow underground and that sunflowers grow as big as our heads”. And we don’t only harvest what we have planted: the Garden space is left mostly wild, with a lot of bramble bushes. So, plenty of bags of foraged blackberries go to the Foodival (see pic, below left, of bread from the Community Garden wheat and foraged blackberry jam at the 2013 Foodival (Credit: Charles Whitehead). TTT is a busy and thriving group – with lots of activities to get involved in, but for some, TTT’s projects are not the attraction: they are looking for ‘time out’, for some quiet work, for hours where they can own what they are doing without too many of the targets and stresses of many jobs. Holding that balance between ‘doing’ and ‘appreciating’ is of course part of TTT’s intention and work. When people go through the gate in to the garden, tucked away among trees behind big buildings, they enter a world that’s different from Tooting’s busy streets, and also different from being on the large Common just metres away. The experience of nature in the Garden is more private (even though it is shared) and there are surprises as it gives up its secrets slowly (if one cares to search them out). Some of the ‘secrets’ are not really secrets at all, they are simply there for the reflective and observant to find for themselves. There are bees, beetles and bugs to look at on the beans, artichokes, and teasels and on the grass right now there are seeds which have spiralled down from the trees. Among the gravel of the garden beds we’ve found a flint tool that was made and dropped here between 2500 and 4000 years ago, when people’s experience of Tooting’s nature was very different. We found a fossilised sea urchin, around 66 million years old – from the period when dinosaurs were still living. We hold regular open events and any more visitors come than we could cope with regularly in the Garden, and that’s fine. 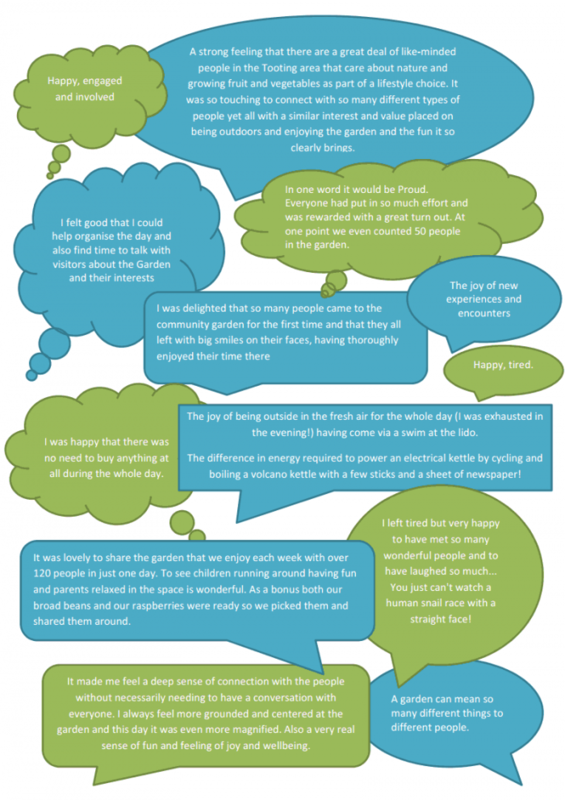 As these responses from our last open event show – people can be encouraged by ideas, action and good company to try out growing at home – or begin to put it altogether into mapping their own projects and routes for ‘low carbon living’. Some TTT members have recently raised funds to set up a supper club with monthly cooking sessions covering seasonal and low carbon cooking and run it from different kitchens in tooting. Meanwhile our lovely friends at Foodcycle Wandsworth host two weekly lunches cooked up from local surplus food – and will be hosting the food collection for this year’s Foodival. The Community Garden isn’t the only place where locals find space to connect with nature. At a local cemetery in the heart of Tooting, the recently created Friends Group has created raised beds for local people to take part in planting and growing activities, benches where people can sit and relax and an apiary with three community bee hives. Recently the ceremonial opening of a gate, closed for 20 years, has created better access to this much needed oasis – allowing residents to enjoy the health and wellbeing benefits of nature and wildlife on their doorstep. As Lucy Neal said ‘Streatham Cemetery is a glorious and under-used green space in Tooting…. the re-opening of the pedestrian gate is a small but very significant moment in bringing this area back into use as a community space for all’. As the map on our early blog showed, Tooting has limited green space, but that hasn’t prevented us making the most of ‘the great outdoors’ even in our predominantly urban setting. In the absence of an obvious ‘public space’ to gather (Tooting has numerous halls but no Town Hall, two indoor markets but no Market Square) TTT has developed a ‘mobile’ approach using walking as a way to connect across our community, to focus on wellbeing and to connect with our environment. The first of these walks was our Tooting Earth Talk Walk where we visited seven places of faith and worship – in shared conversations we discovered much common ground about man’s relationship with the earth and the need to respect and care for our natural environment. Later, on a glorious sunny morning in May 2012, we gathered at the sparkling waters of Tooting Bec Lido for a day long Treasuring Tooting’ walk, celebrating places and things that contribute to our local wellbeing. More than sixty local people joined us as we strolled from the Lido to the Bingo Hall, the Community Garden to the Islamic Centre. At each place a different aspect of our happiness and wellbeing was experienced and celebrated – through walking, making, talking, laughing, learning, planting and giving. This ‘mobile’ approach came into its own at our second Foodival where locally grown produce was distributed to and cooked up by seven local restaurants. A growing crowd followed this map as the fold-up ‘table of plenty’ we used to served the food Pied Pipered its way up the busy high street. Which brings us neatly back full circle, to the Foodival, now in its seventh year. At this year’s event on 14th September we hope break our record by feeding 300 people in one day using locally grown food, cooked by local people. Local restaurants will be serving up taster dishes throughout the day, and the winner of the Top Tooting Cook competition will be announced. 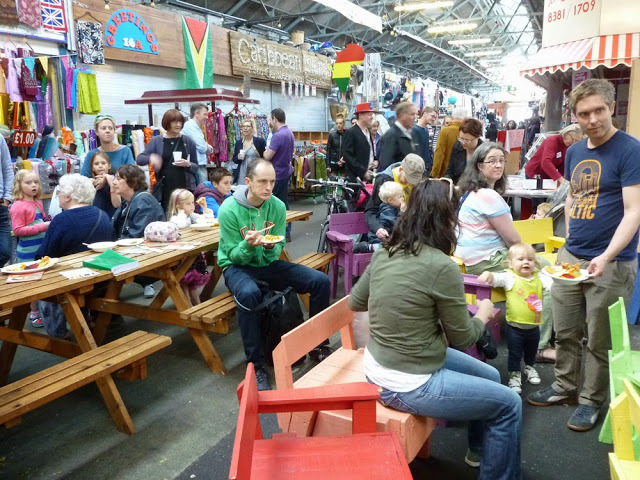 There will be plenty to entertain people, young and old – cooking demonstrations, music, theatre, activities, stalls and games – all with a sustainable local slant. If you are in the area do come and join us – more details here. “We’re always amazed by the amount of produce that people are growing in even the smallest space. People have been adding some wonderful pictures to our map showing the amazing things growing in Tooting” says Dave Mauger, Foodival’s event director.